The $15 minimum wage pushed by the Democratic Party and standard-bearer Hillary Clinton would lead to the loss of more than 7 million jobs, a Heritage Foundation report said. Democrats on July 25 approved a party platform backing the $15 minimum wage following a multi-million dollar campaign by the Service Employees International Union and pressure from supporters of socialist Sen. Bernie Sanders. According to the report, a $15 minimum wage (more than double the current federal minimum of $7.25) would effectively raise labor costs to more than $18 an hour per employee, after payroll taxes and other mandates. “Businesses would respond to these higher labor costs by reducing employment of affected workers by over one-sixth, thus eliminating approximately 7 million full-time-equivalent (FTE) jobs by 2021. Forcing employers to pay starting wages of $15 per hour would make many less skilled workers unemployable,” labor policy analyst James Sherk wrote for the Heritage Foundation. Sherk estimated that an increase to $15 would affect more than 30 percent of all workers. The move would make it more costly to hire new and entry level workers, but would also drive wages up for more highly-skilled workers that earn above the minimum wage, but below the $15 hourly rate. Sherk called the Democrats’ proposal “unprecedented” in its scope. “Federal and state minimum wages typically cover between 4 percent and 10 percent of the workforce,” the report says. “The minimum wage has never before come close to covering such a large share of workers. Whether expressed in real dollars or as a proportion of workers directly affected, no state has experienced minimum starting wages this high. 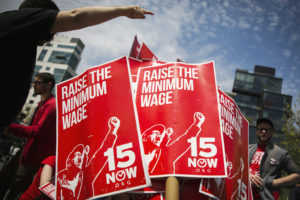 Michael Saltsman, research director at the Employment Policies Institute, said that Sherk’s report follows the consensus among labor experts, including liberal economists on the $15 minimum wage. “This report confirms what economists have told us for years: Creating an unreasonably high starting wage of $15 an hour costs jobs. Even Democratic economists understand this — it’s unfortunate that the party faithful do not,” Saltsman said.